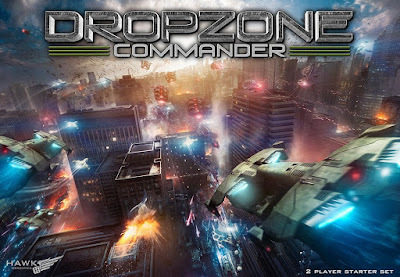 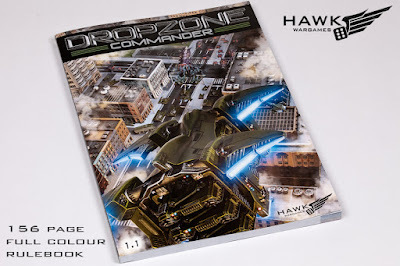 I have fancied doing Dropzone Commander for a couple of years or more. 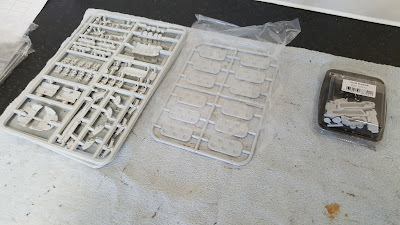 I was lucky enough to come across a second hand two player starter set on eBay going cheap so here we are. Some Scourge reinforcements and the wife built the last of my card buildings. 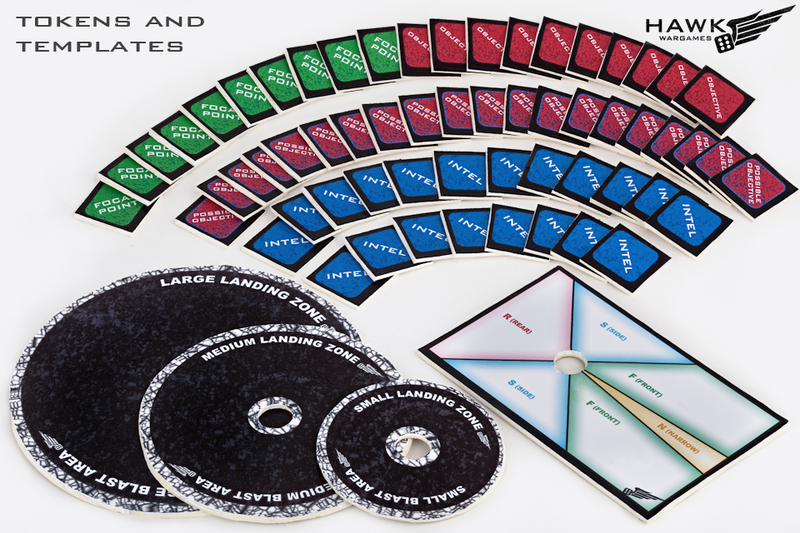 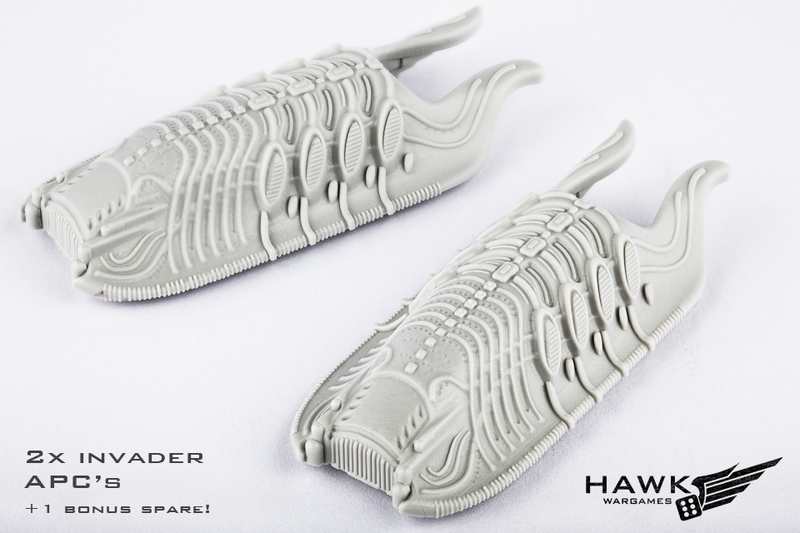 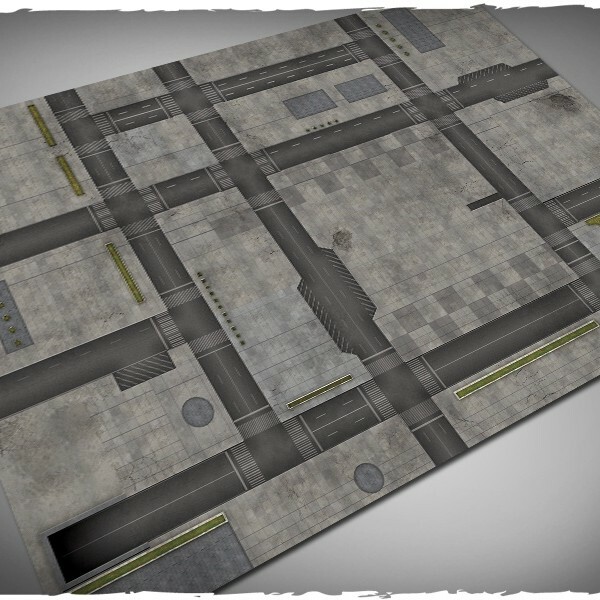 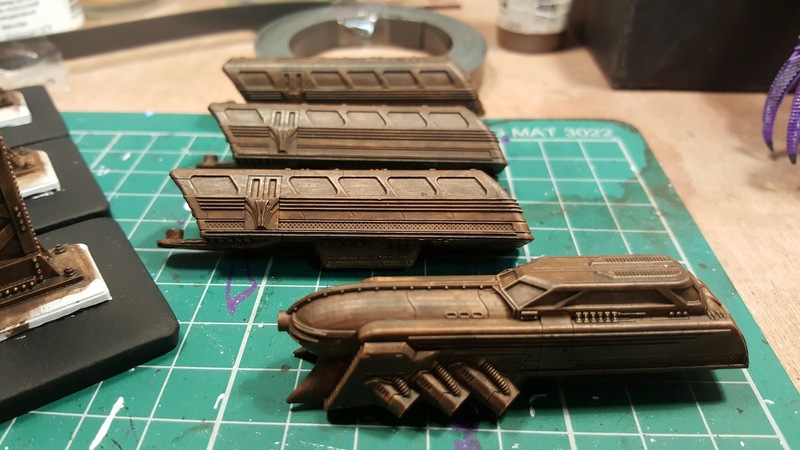 Here's a link to the first lot we did Dropzone Commander Buildings. 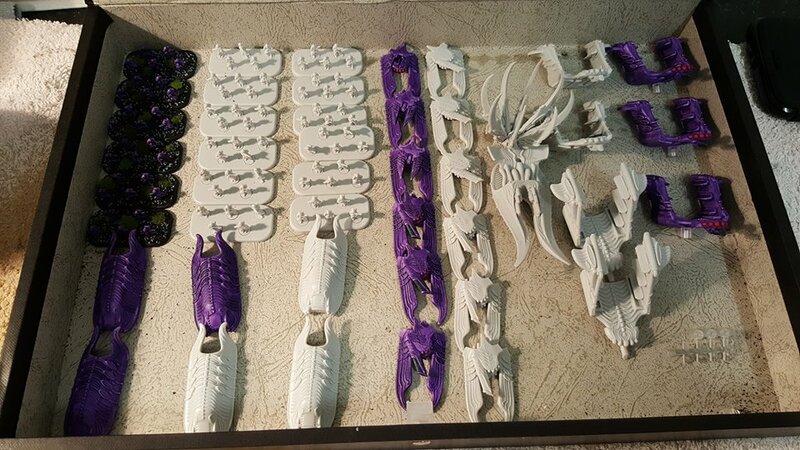 I've finished assembling the rest of the Scourge. 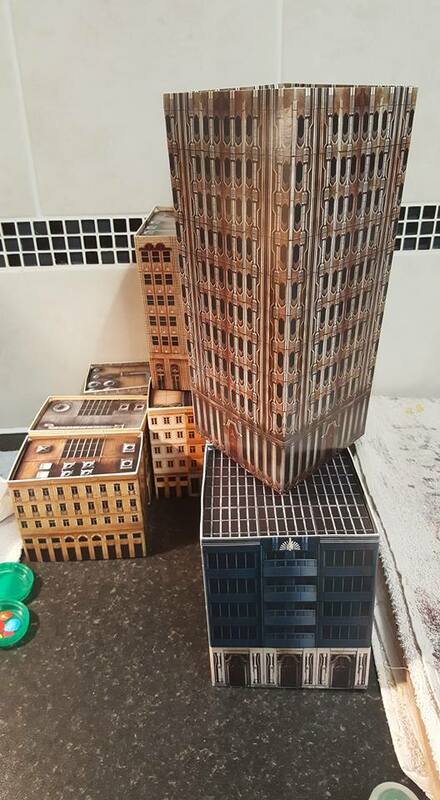 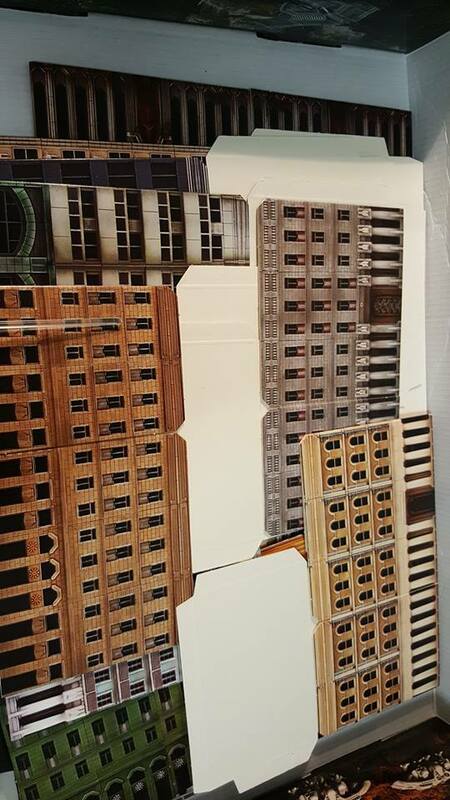 The wife very kindly built my card buildings from the second starter set and reinforced them with foamboard. 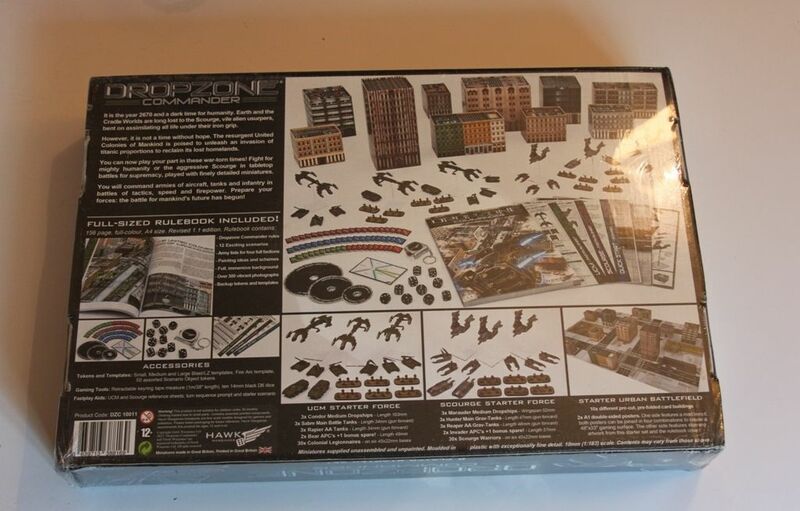 Here's a link to the first lot we did Dropzone Commander Buildings. 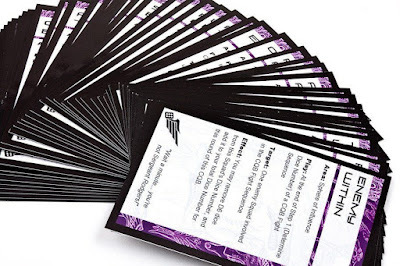 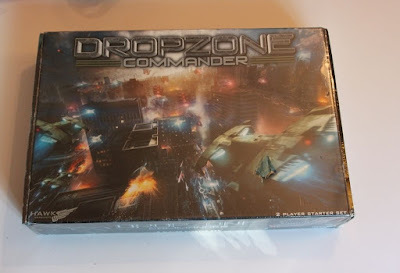 I managed to get hold of some more Dropzone Commander Card Buildings from eBay. I started my third two player starter set. 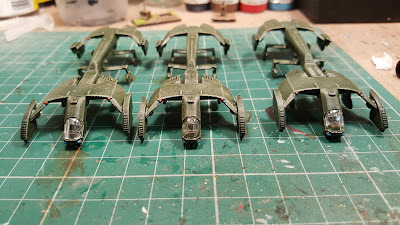 3 more Condor medium dropships finished. 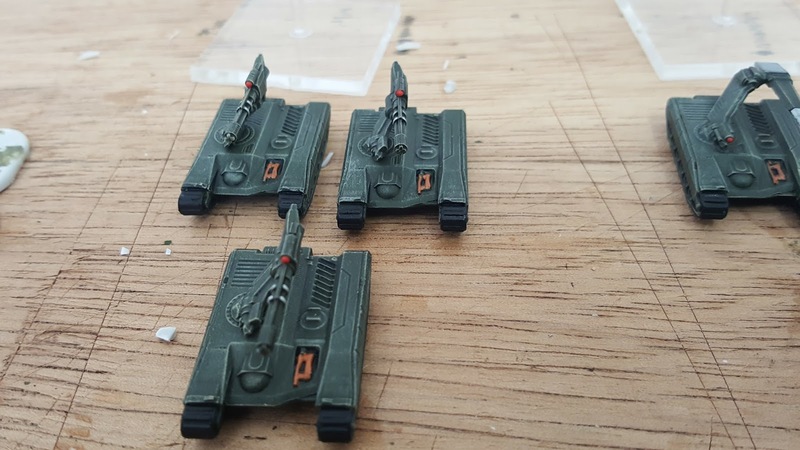 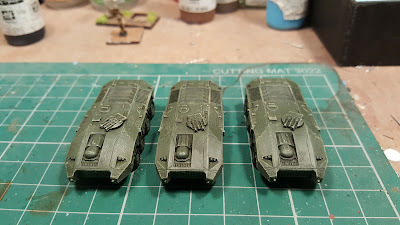 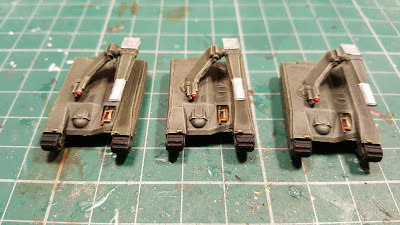 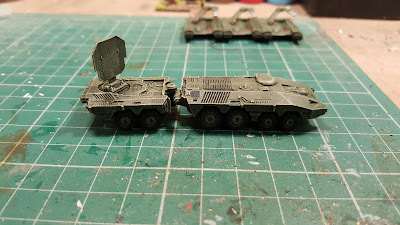 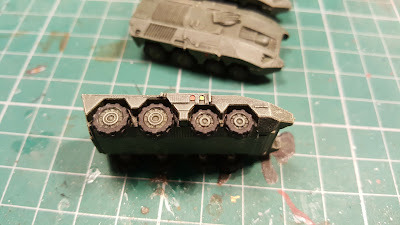 3 more Sabre tanks and the Kodiak armoured command vehicle finished. 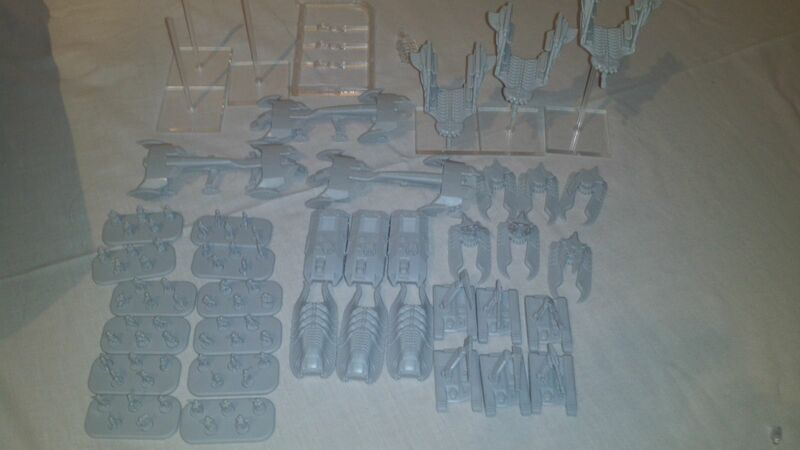 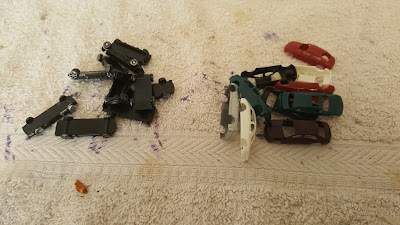 I bought some UCM and Scourge from eBay. 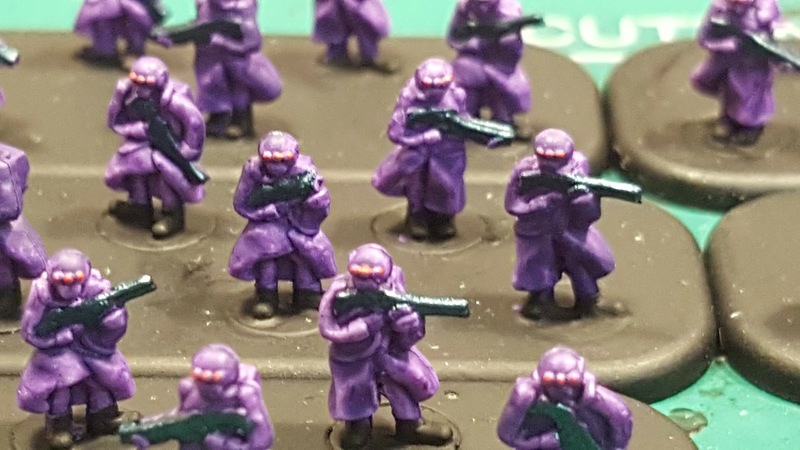 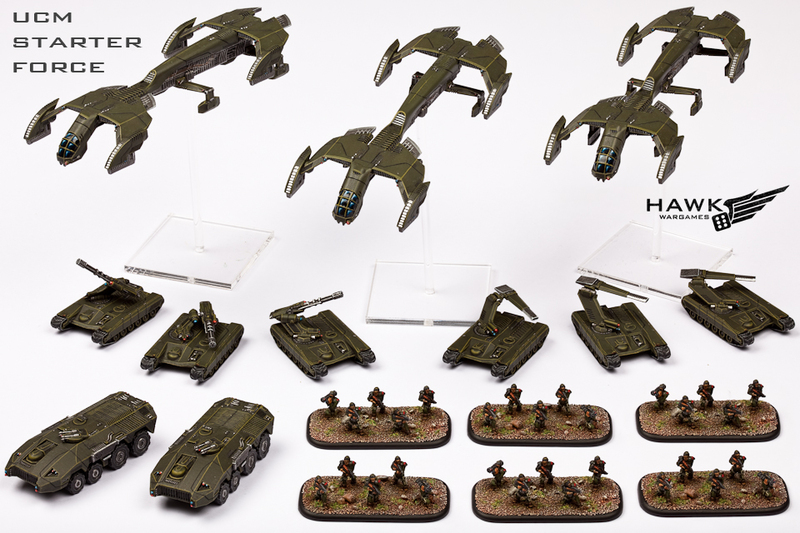 Some more Dropzone Commander Infantry. 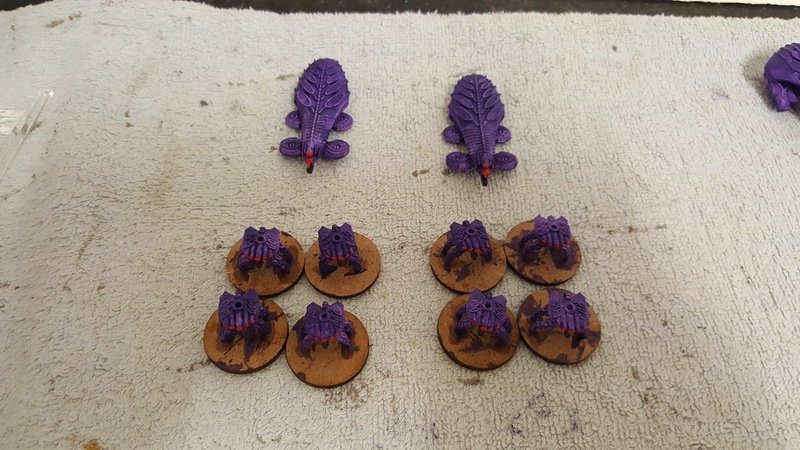 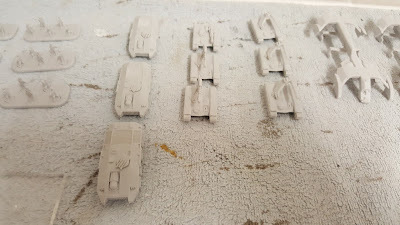 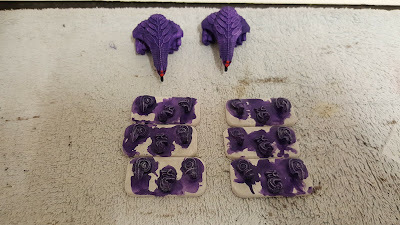 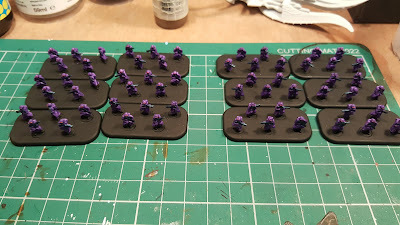 I also started work on some UCM reinforcements. 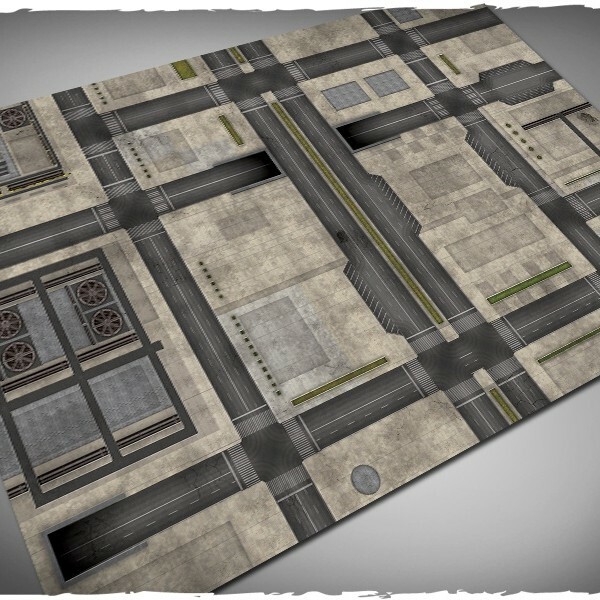 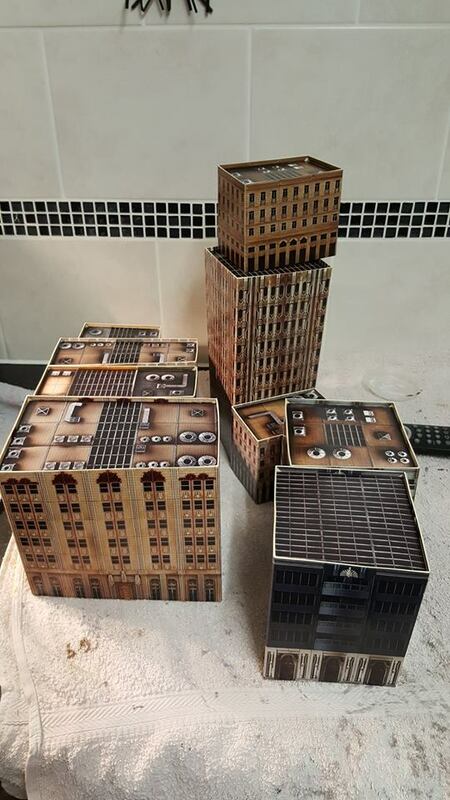 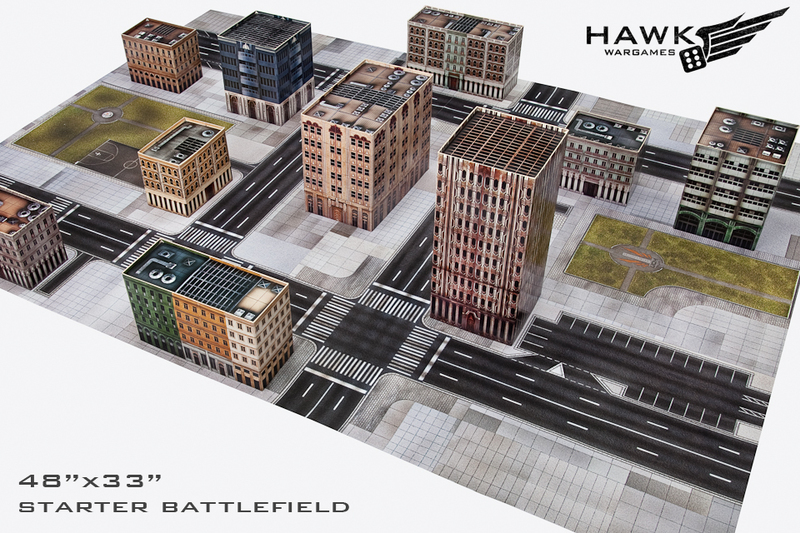 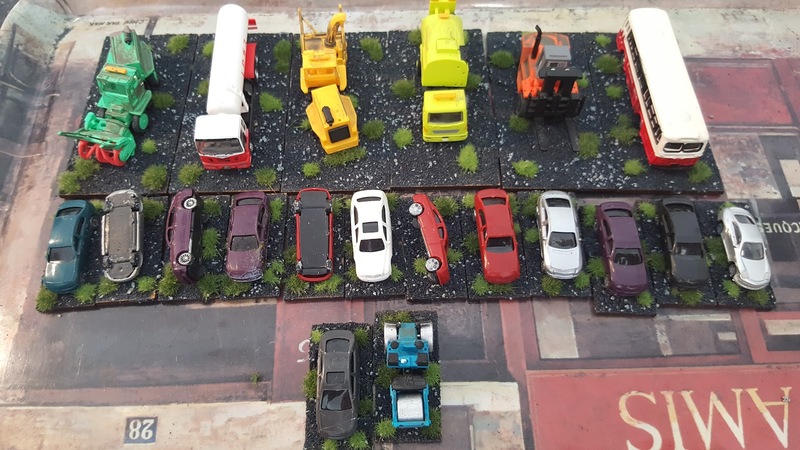 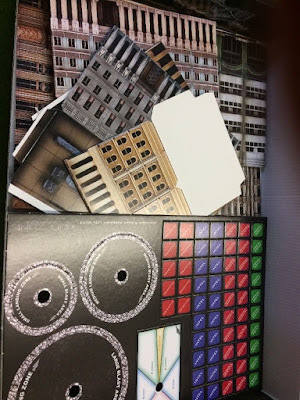 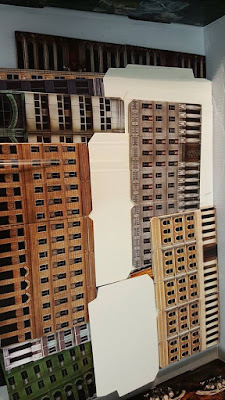 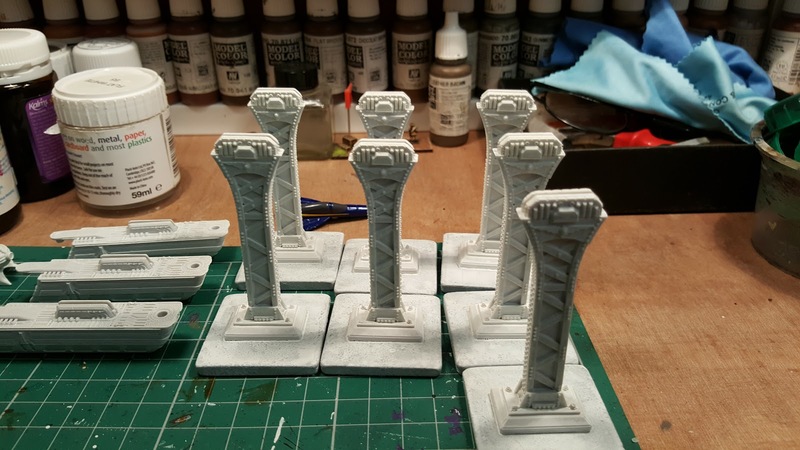 I have ordered two Deep Cut Studio mats, Wargames terrain mat – Cityscape #1 and Wargames terrain mat – Cityscape #2 one is for the club (Grimsby Wargames Society) and the other for home. 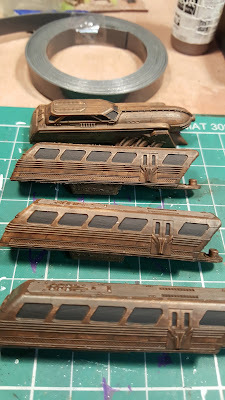 The Monorail has been a popular form of urban transportation on human worlds for many hundreds of years. This, the almost ubiquitous 'Silver Bullet' model, is by far the most common and has changed little from before humanities' Age of Expansion to the present day. It is fast, robust and famously reliable since it employs very few moving parts. 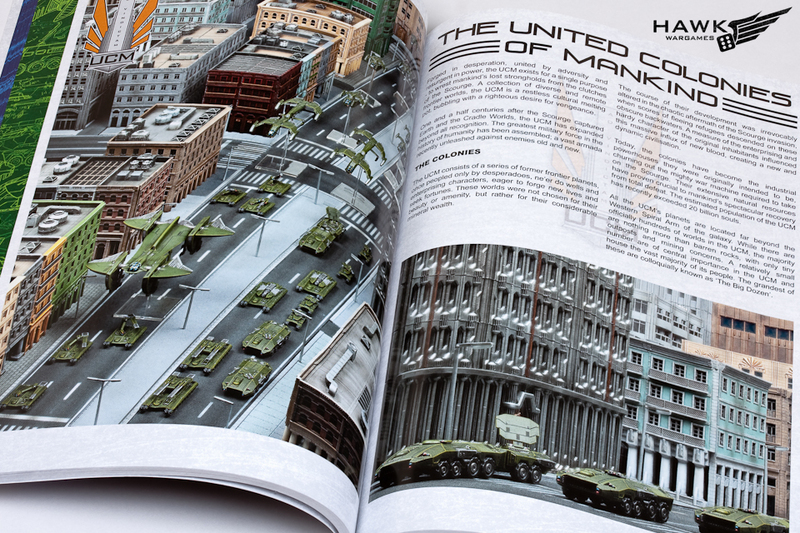 It is also self-powered, allowing it to operate independently of a city's energy grid. Human-built monorails are known to still be employed by Scourge forces on the Cradle Worlds and are occasionally commandeered by Resistance forces when needed. 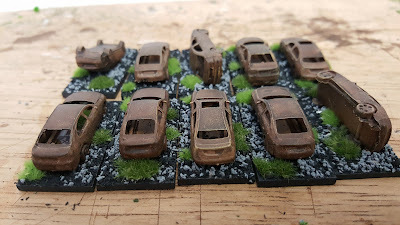 In fact, it is apparent that a long abandoned Silver Bullet can be brought back to life with as little as fresh fuel and basic tools. Although normally civilian vehicles, in these times of war they have frequently been pressed into all sorts of improvised military roles, from the efficient movement of supplies to VIP transport. 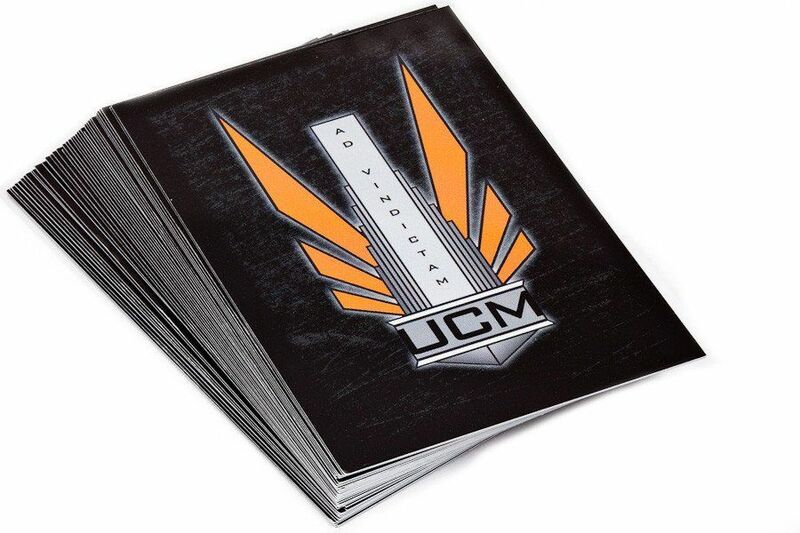 Indeed, they can often prove to be critical objectives for a variety of missions. 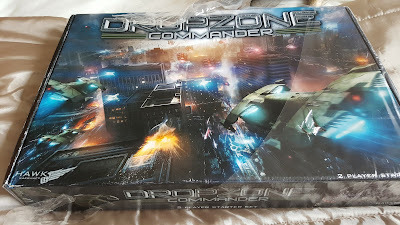 My second Dropzone Commander 2 player starter set has arrived today. 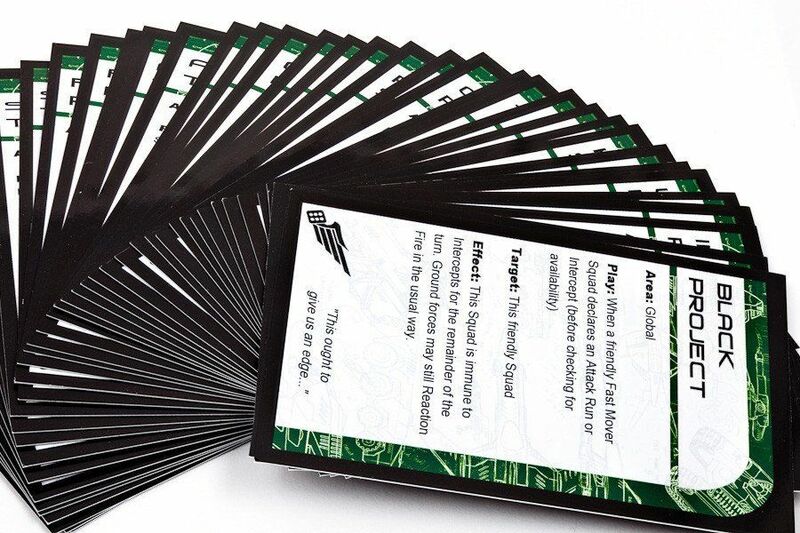 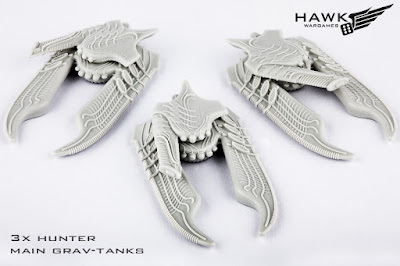 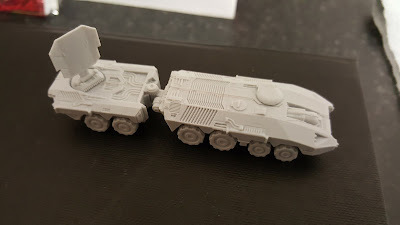 Which i'm going to use for my Tabletop Commanders, Winter Warmer Challenge!. 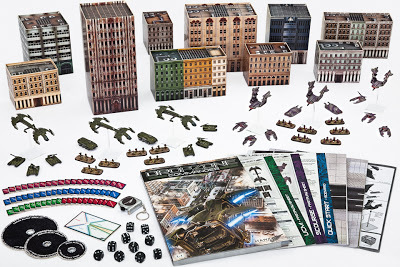 Ok don't tell anyone but I have succumbed and bought a second two player starter set which will get a lot of the units on my want list. 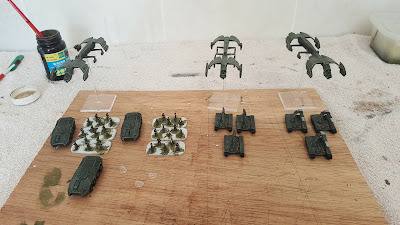 Ok a quick recap on what I need now to complete my starter armies. 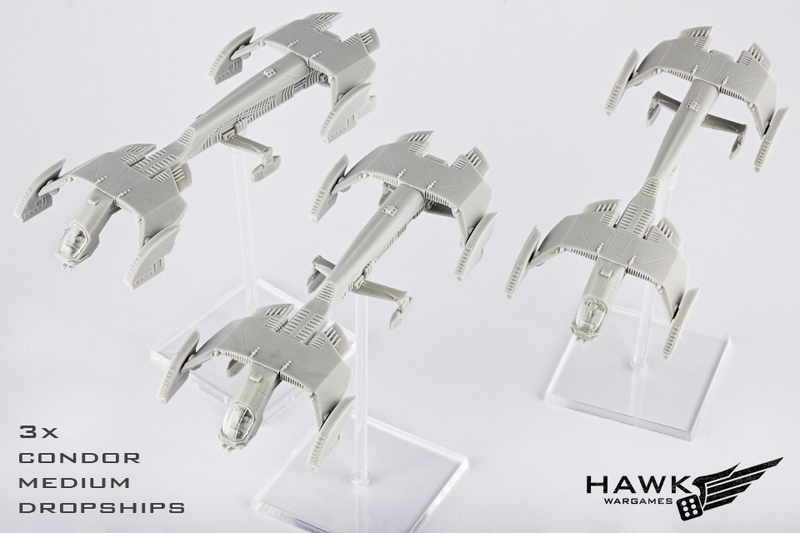 1x Albatross heavy dropship, will provide you with the classic UCM brick (6 Sabres and 3 Rapiers) which can really hold its own against most foes. 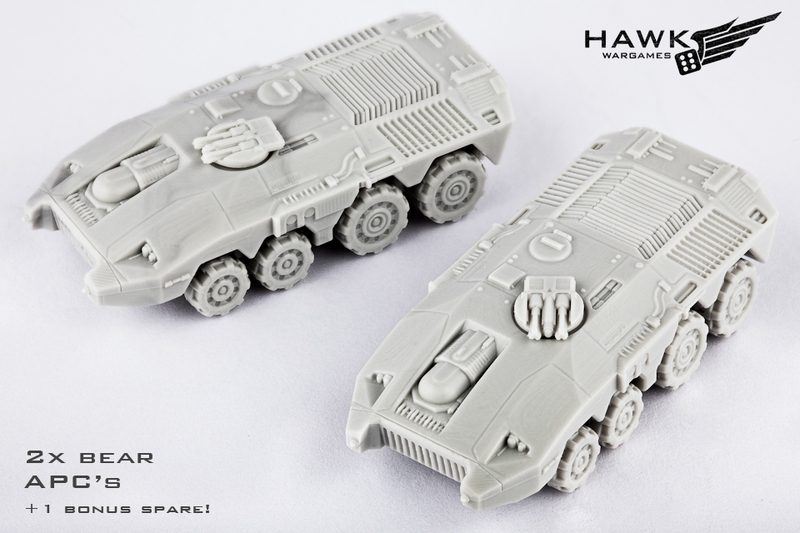 Commander – Kodiak, It’s durable but slow, definitely keyed to sit back and call down orbital bombardment wherever you need something dead. Thanks to the recent errata, the Kodiak now has a small template for its Orbital Strike, giving it even greater lethality. 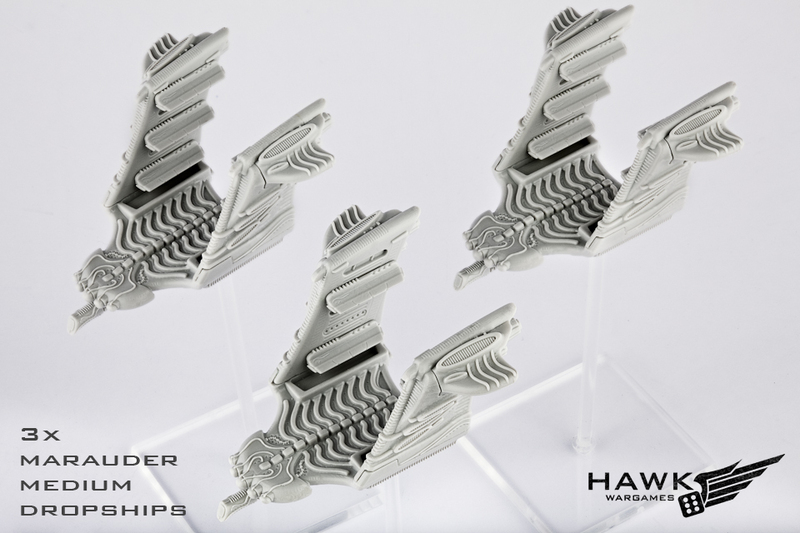 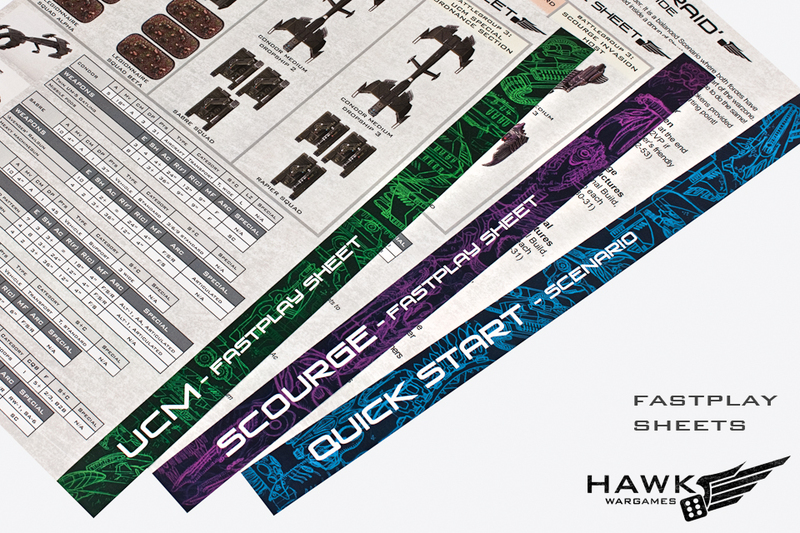 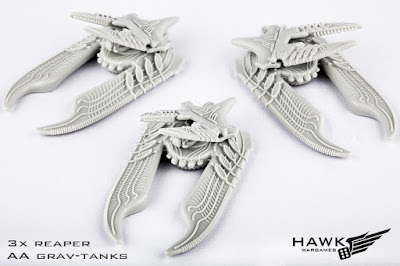 2x Archangel Interceptors, These inexpensive Fast Movers let you take advantage of the UCM’s aircraft-slanted command deck, and provide valuable backfield striking power against enemy artillery and dropships that your slower tanks lack. 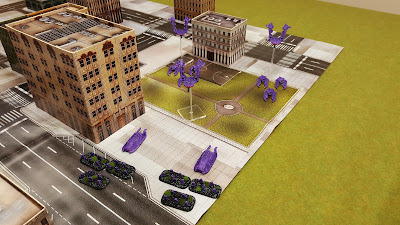 Commander – Desolator, Aside from being your basic commander and one of the coolest models in the game, the King Squid lets you fly around going all Independence Day on formations of enemy armor and buildings whenever you want. 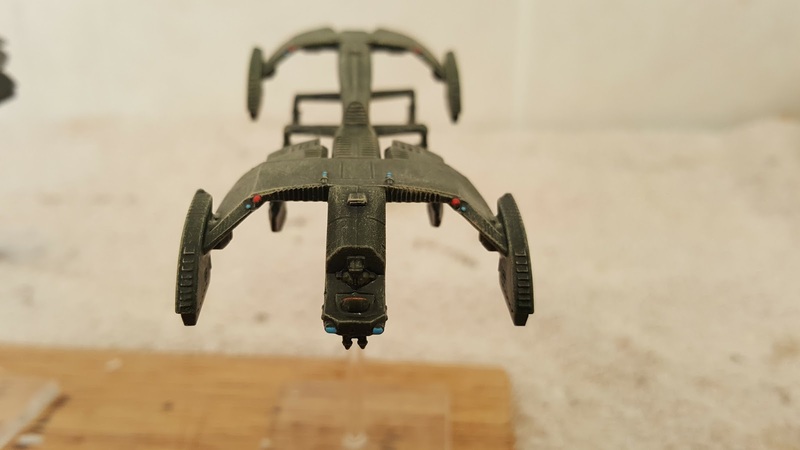 2x Intruder Alpha, Scourge’s light dropships have a 30” move, allowing you to zip around the battlefield grabbing objectives. 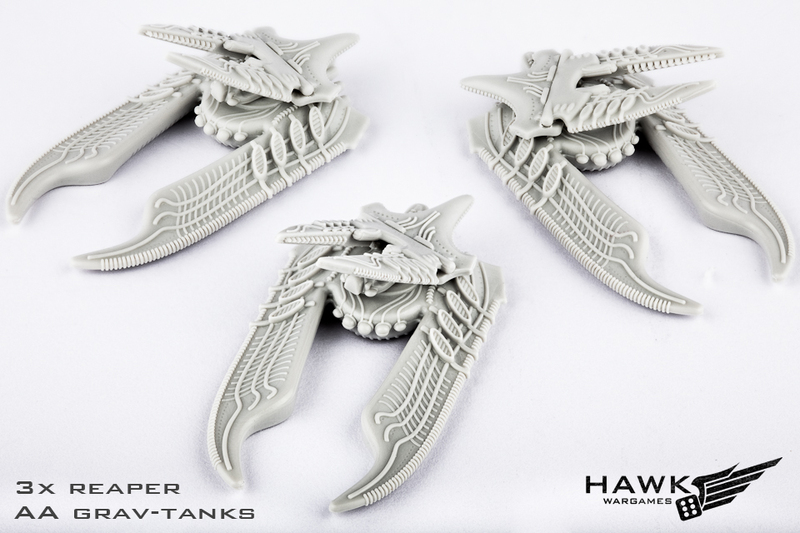 They’re also useful for carrying units of Destroyers (see below). 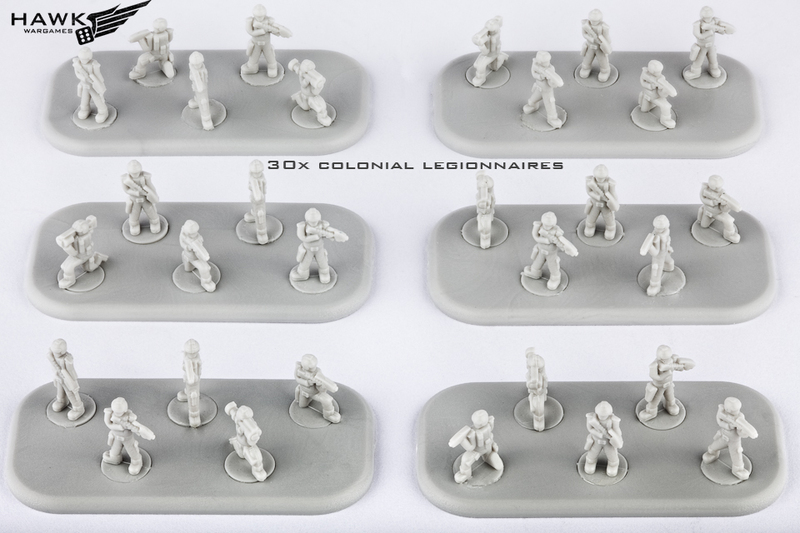 2x Intruder Beta, The Beta variant carry the Scourge scout units, allowing you to spread your command radius around the table. 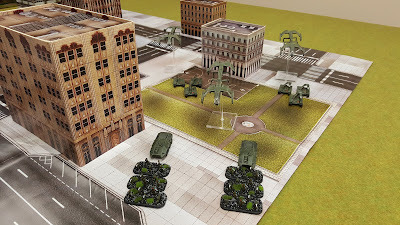 4x Destroyers bases, Arguably the toughest infantry in the game, Destroyers are a huge boost to the Scourge army with strong CQB skill, incredible toughness, and reliable anti-tank shooting. 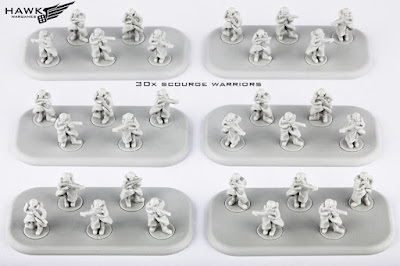 They’re tough enough they can search for objectives in buildings further forward or more exposed to enemy fire than Scourge Warriors. 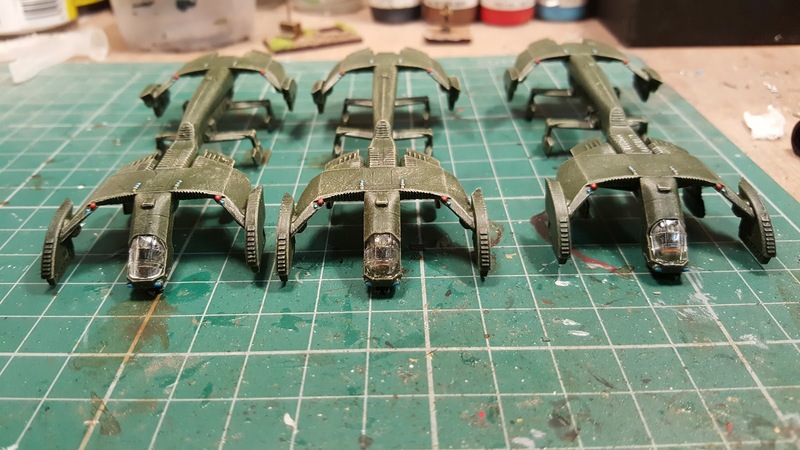 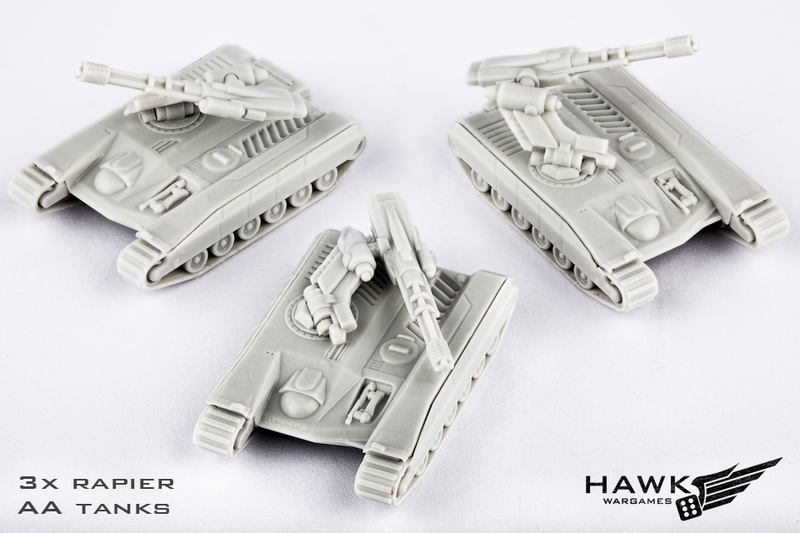 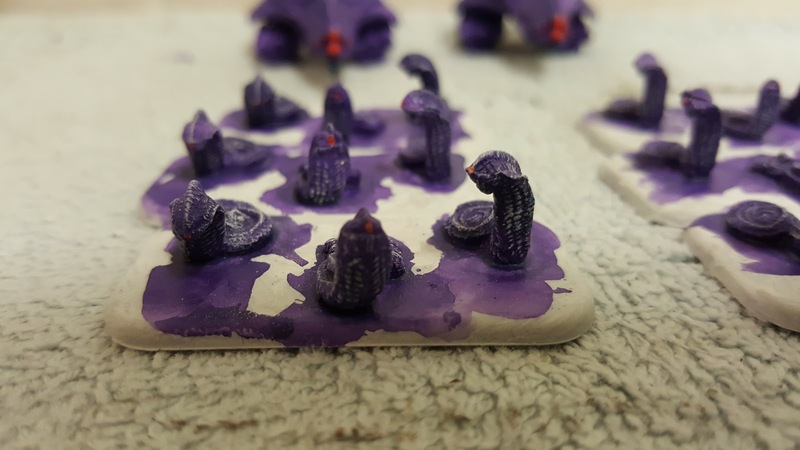 8x Prowlers or 8x Minders, The Scourge has the best scout units in the game in the ground-based Prowlers and the flying Minders. 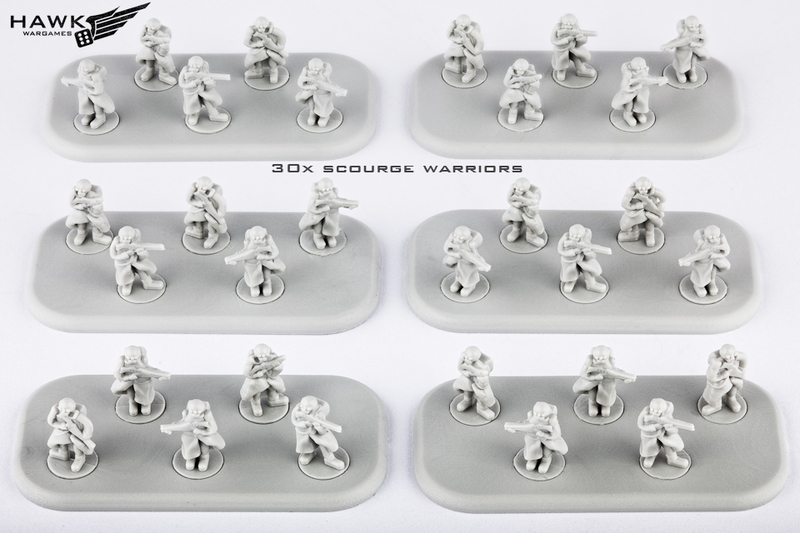 Because the Scourge benefits so much from Command Cards, scout units are essential to spreading your Sphere of Influence, and it doesn’t hurt that both units are incredibly cheap and strong for their cost (Prowlers have a massive E11 close combat attack, while Minders have a 2+ accuracy E6 AA shot). 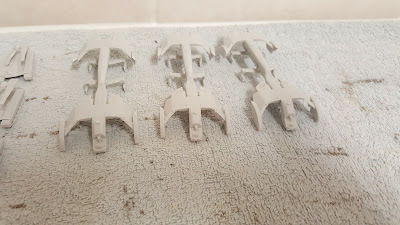 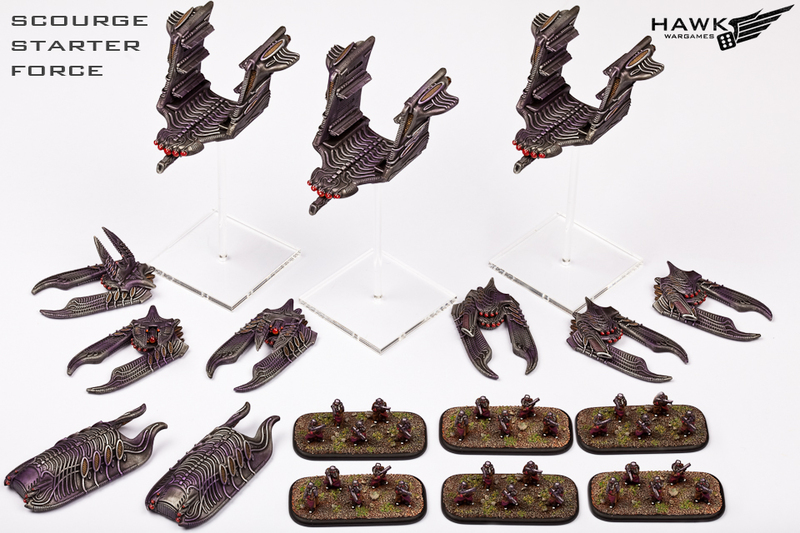 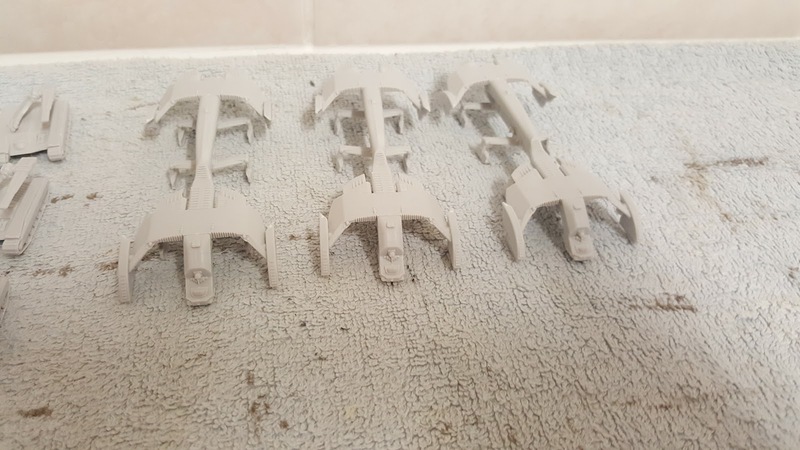 2x Reaver Heavy Gunships, If you have a few extra quid, these versatile gunships are a huge boon to the Scourge army. 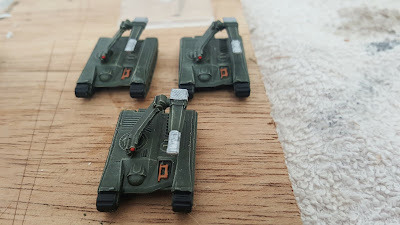 With 24” aircraft movement and 2 E10 + 1 E9 shots that can be spread amongst different targets, these things are a great way to counter light armor or ambush enemy ground units without AA cover. 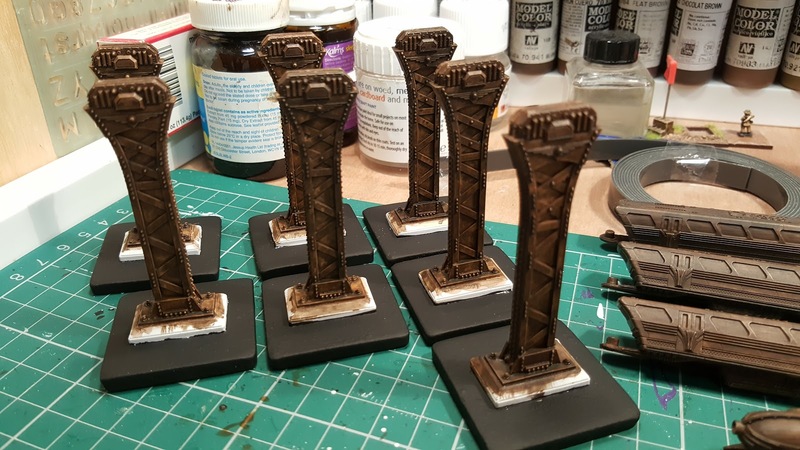 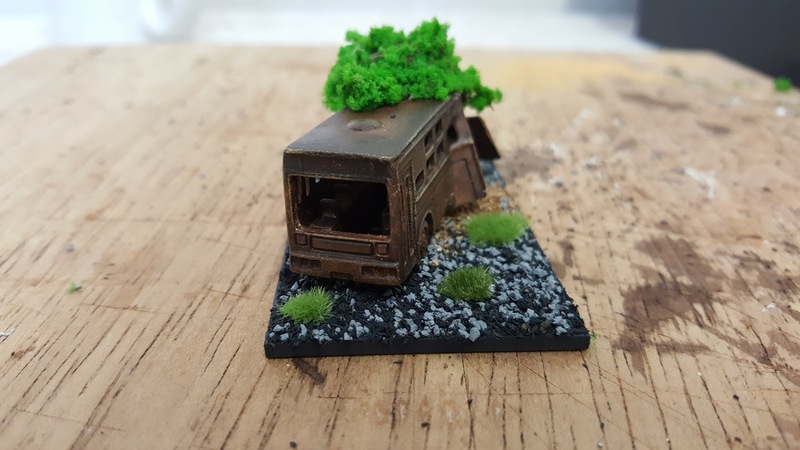 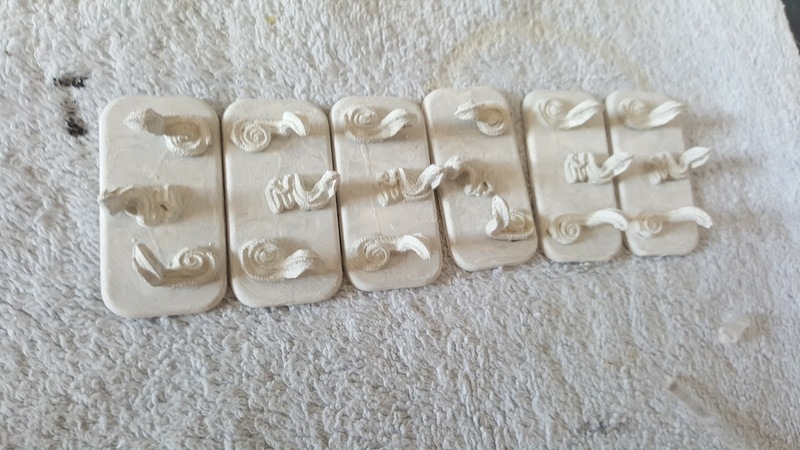 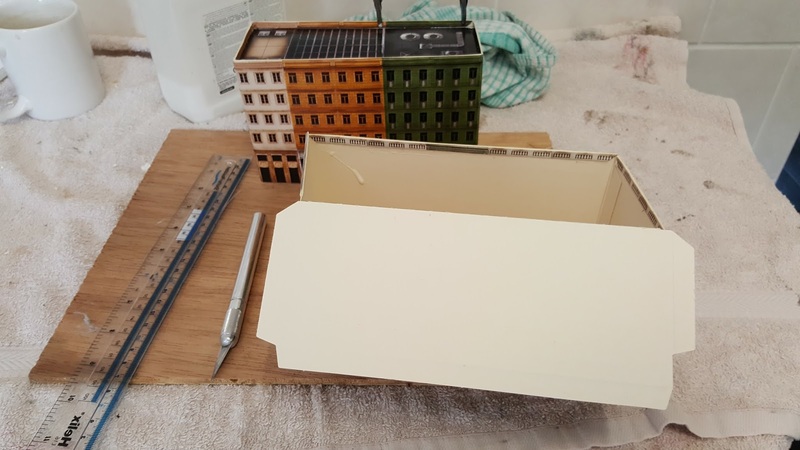 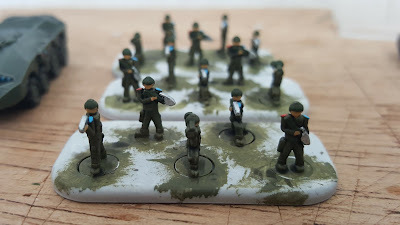 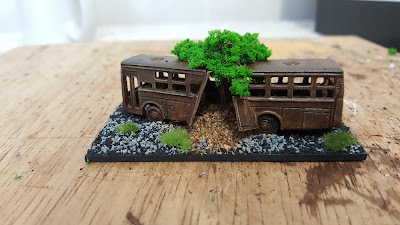 I started doing some scenery only a small amount to start with if this game takes off at the club then I will certainly expand the amount of scenery I do. 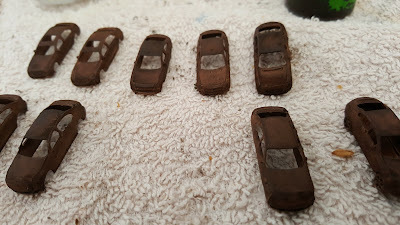 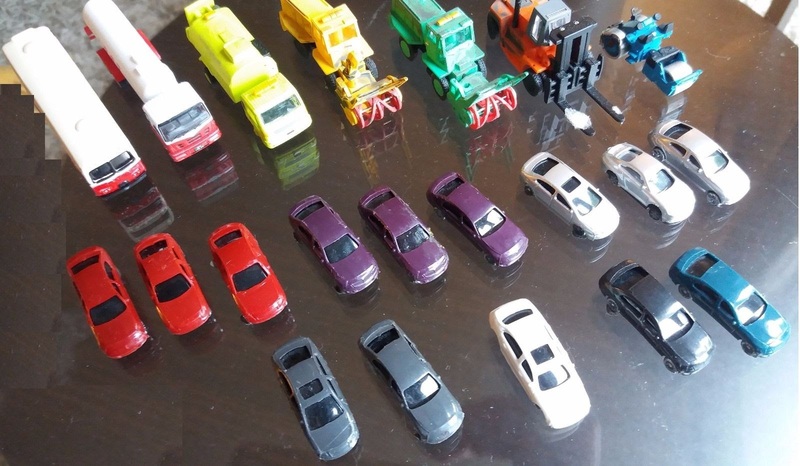 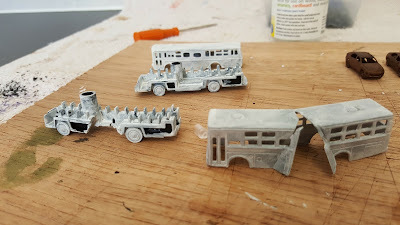 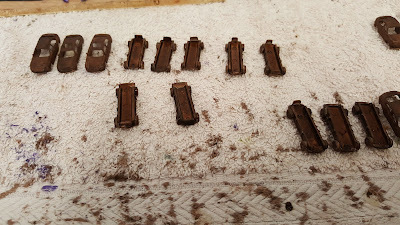 I basically used some N Gauge buses and N Gauge cars you can buy these from anywhere. At some point I will do the tutorial of how I did them. 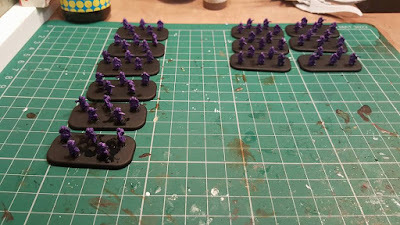 I had just about finished my UCM army just needed finishing touches. 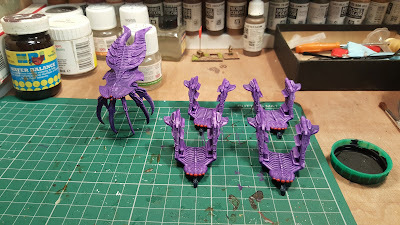 I started assembling my Scourge army, I was pleasantly surprised at how easy it's all went together. 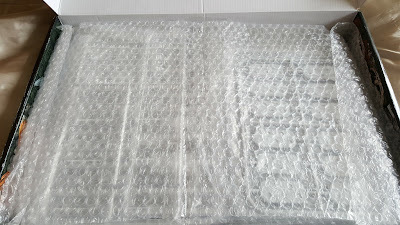 I managed to pick up both of my command decks from eBay for a reasonable price. 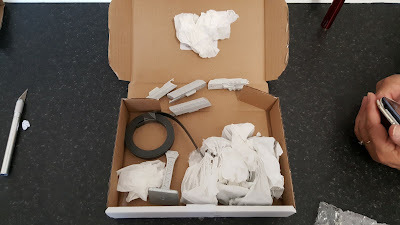 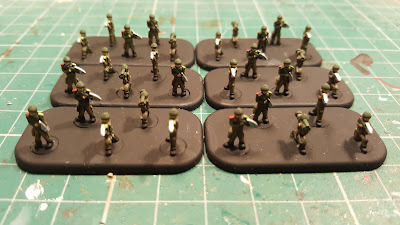 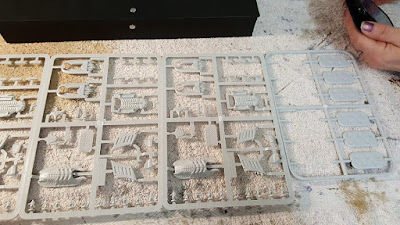 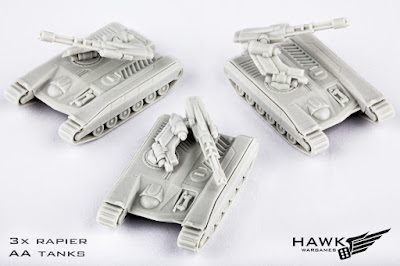 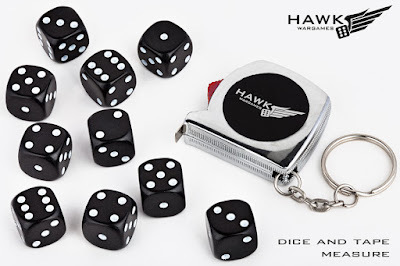 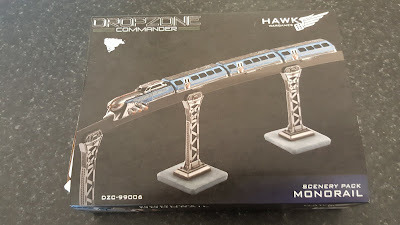 After discussing how I should expand my two player starter on Hawk Wargames Forums Link no longer working A couple of people came to my assistance with very good suggestions. 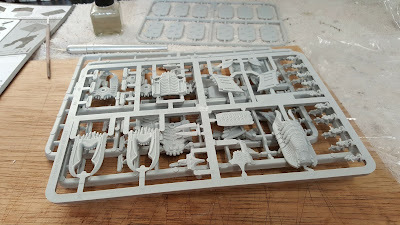 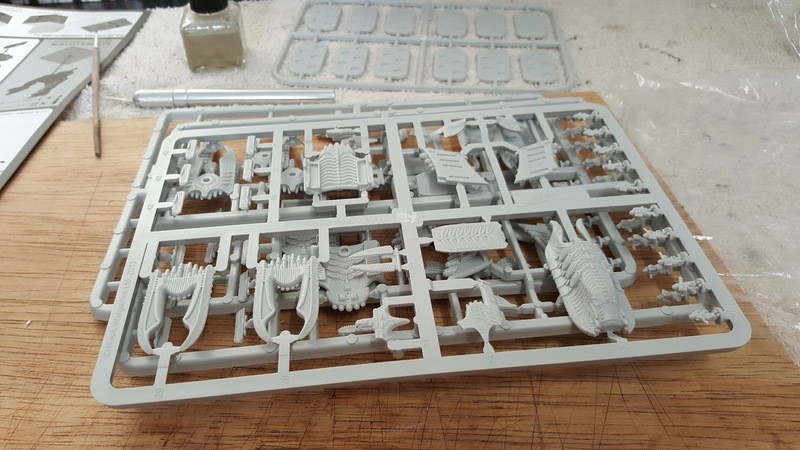 A member called BlackLegion gave me a terrific link on how to expand your Dropzone commander armies. 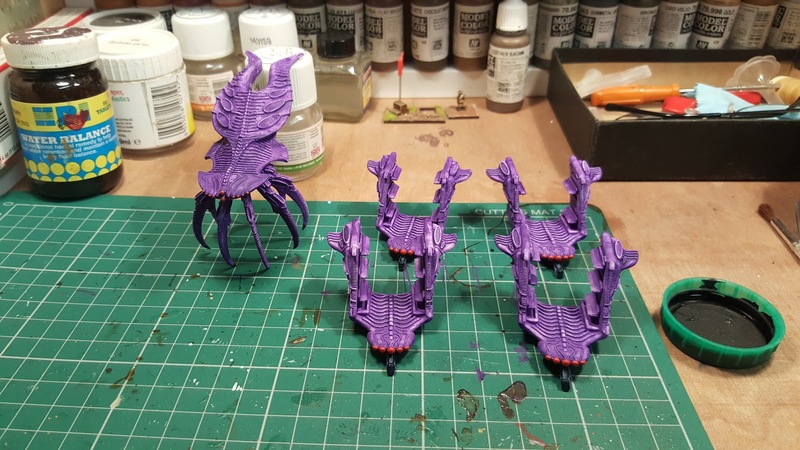 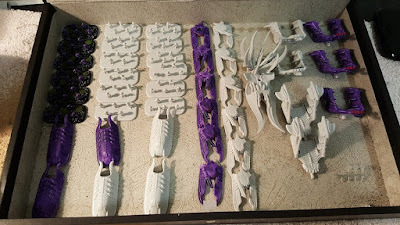 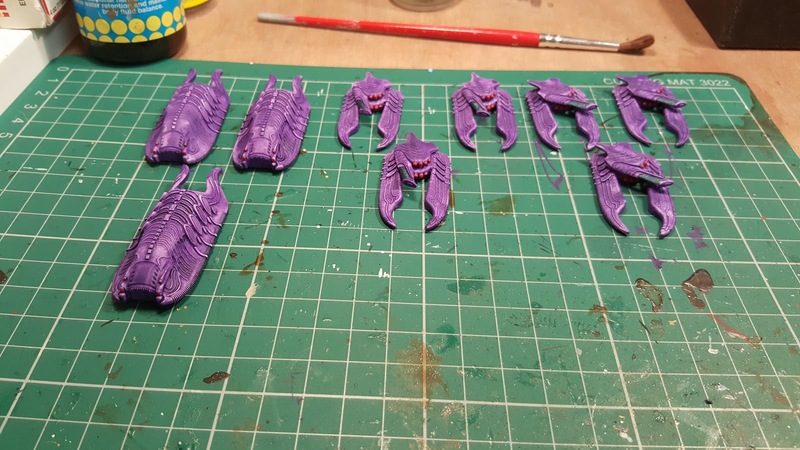 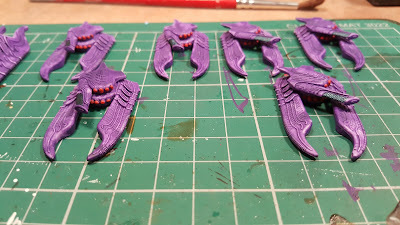 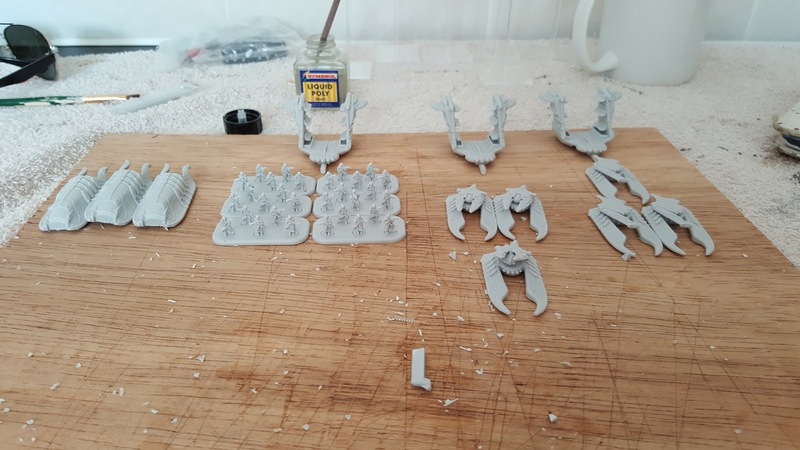 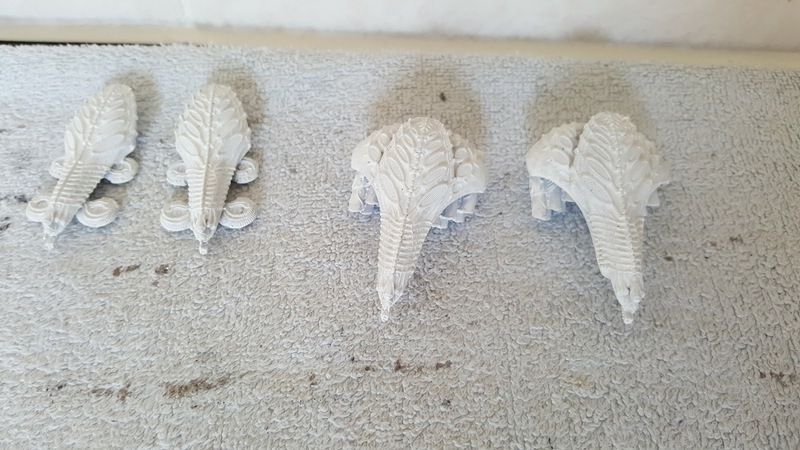 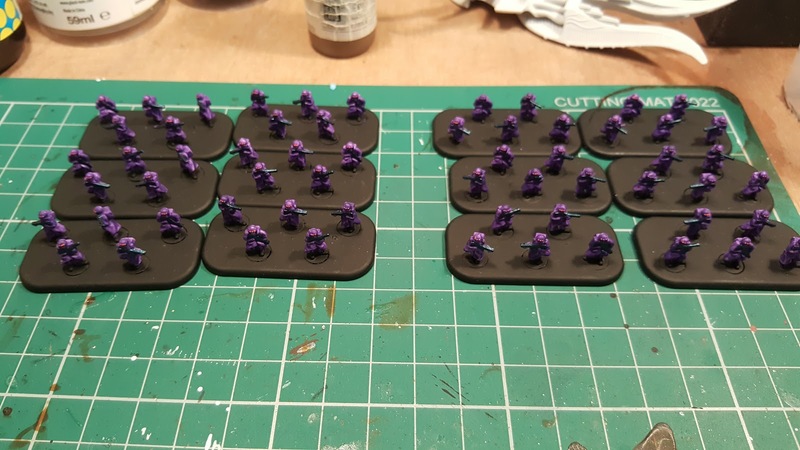 Building a DZC Army on a Budget. 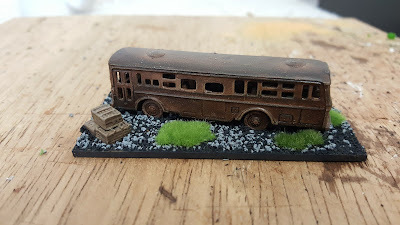 Another member J.D. 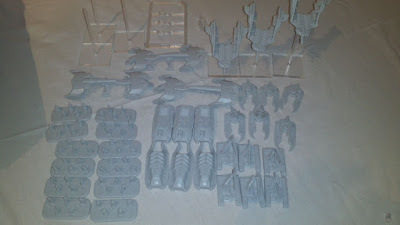 Welch also thought it was a good idea to get another two player starter set. 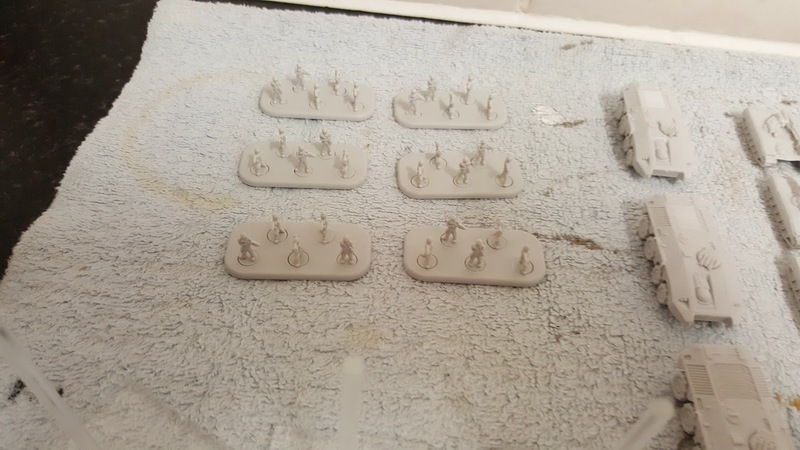 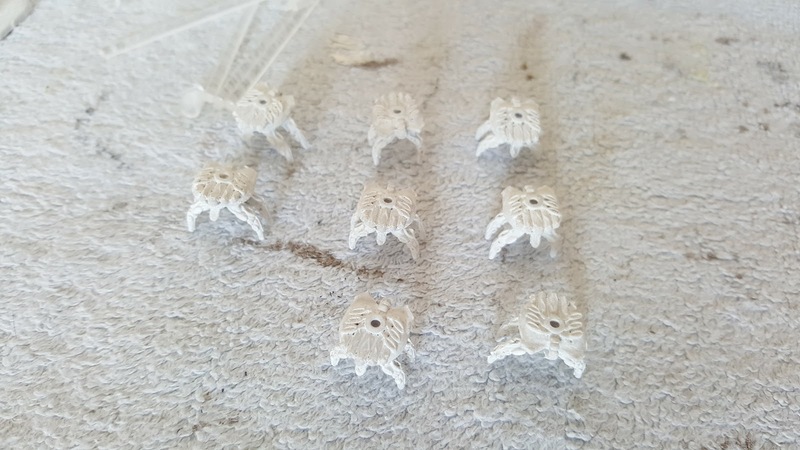 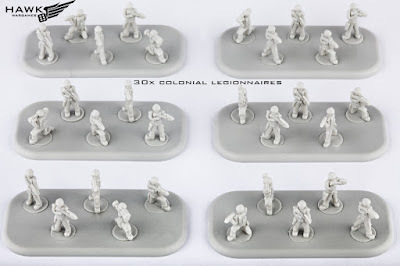 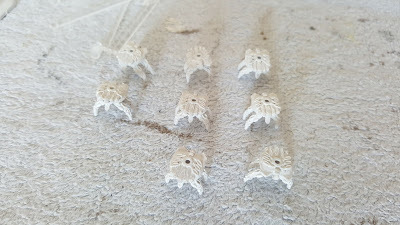 30x Colonial Legionnaires, The additional infantry is most welcome as well. UCM Command Deck, Supports the team, makes the enemy scream. 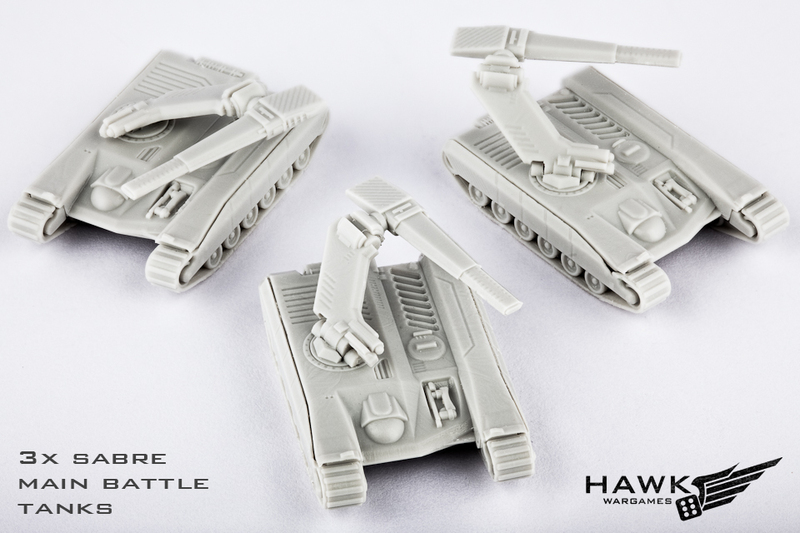 Strong support for your aircraft and CQB battles. 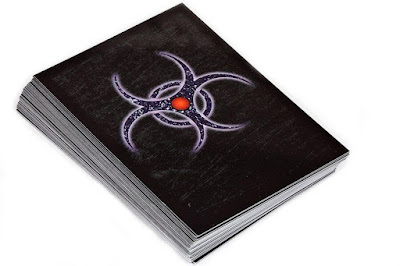 Scourge Command Deck, The Scourge Command Deck brings crucial survivability and tricks to their army…traits that make the Scourge more dependent upon Command Cards than most other armies. 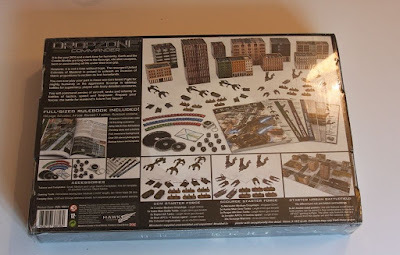 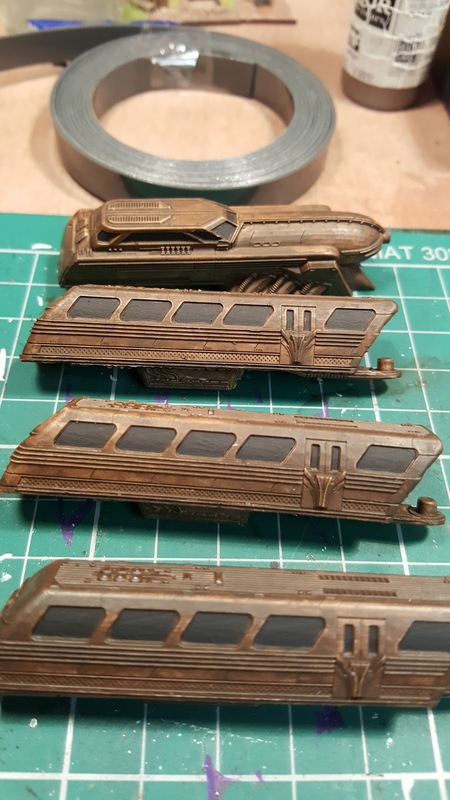 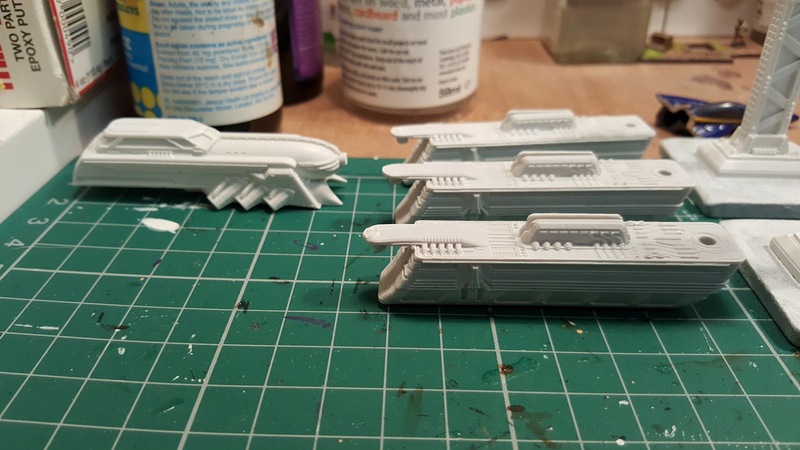 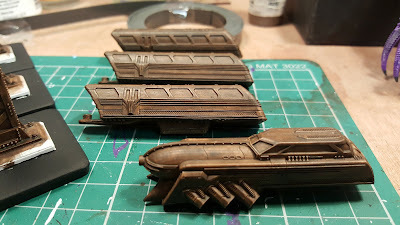 I started work on my Dropzone Commander Buildings. My Dropzone Commander journey starts today as I received my parcel from eBay. - Both posters feature stunning artwork on the reverse face! I managed to pick up a two player starter set for Dropzone Commander today from eBay.